There are a TON of Apps available for iOS. 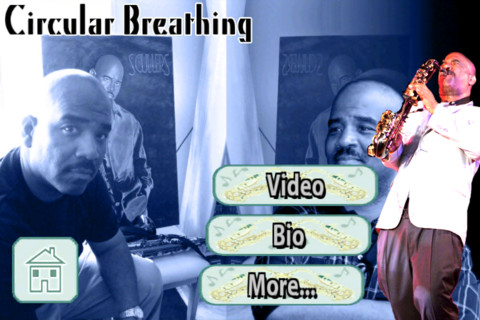 One app, Circular Breathing by Walter Beasley caught my eye after I read about it on a website I subscribe to in my RSS feeds. Ok, lets get the good stuff out of the way before I start tearing the “App” apart. It’s a fairly good tutorial/demo of how to circular breathe. Now, the bad stuff. And there is a lot. First, there is this FREAKING ANNOYING intro music for everything. It was cool the first time. But the start of EVERY VIDEO has it. The start of the App has it. Seriously Walter…..it is annoying as all hell. Second, the App is just basically a shell with some videos that are chapter-ized. The there are three buttons and a “home” icon. The home icon takes you to Walter’s website….how thoughtful. The Video takes you to the videos. The Bio presents you with a scrollable text of Walter’s bio. And the More button takes you to a page where he’s pawning his other “App” Sound Production For Saxophone, his Facebook, Twitter, “Home” (website link) and YouTube videos. Third, the App does not remember where you were. And it does not orientate. And it doesn’t really support iPad (you have to scale it). So, is it worth the $1.99? I guess….I think Walter should have included higher quality video with it (for iPad). But I think he could have just released this as a paid video for $1.99 instead. I give it 5/10. You can easily find tutorials about circular breathing on YouTube for free that are as informative if not more. And they don’t have the annoying intro.